Below is a list of tried and true adventures, exciting ways to spend your time away from the hubub of life and perhaps, find a new activity or scene to nurture your sense of wonder. It is easy for us to get caught in a rut of sameness; each idea below is a call to live beyond your comfort zone, to become stimulated by new surroundings and movement. My hope is to provide what you need to know to embark on a new adventure. 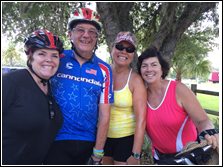 If you need a partner to join you, go to my calendar of events or Facebook page and sign up. I first learned about this sport while bicycling through a park in Clearwater and watching with interest a group of men pushing strollers! What is this, a Daddy’s Walking Club? On closer inspection I saw each stroller filled with neatly stacked collections of frisbees, the men were part of a team competing with others in the park. 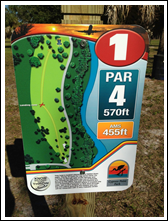 Disc Golf, also known as Frisbee Golf, is growing in popularity and attracts young and old. The game is played much like golf; golfers have their clubs, each with a different function, Disc Golf uses a set of frisbees that drive, putt or move the player closer to the “hole”, a metal basket placed atop a pole. Golf has its 9-hole and 18-hole courses, Disc Golf does as well. But instead of paying for green fees and golf cart rental, Disc Golf requires a minimum cost. In fact the only investment for play on most courses throughout the U.S. is the cost of a frisbee, less than $15. Many courses are located within established parks. To view a map showing locations throughout the world visit the website above. There you will find rules of the game and a brief video orienting you to the game. Locals in Tampa Bay have over 14 courses to choose from including one rated sixth in Florida, located in Cypress Point Park, a beautiful wooded area near Tampa Int’l. Airport. 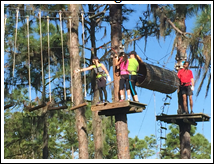 structures built among tree canopies at Treeumph, an adventure nature park 9 miles east of Bradenton. We purchased the Junior ticket which allowed plenty of challenge on three courses; an adult ticket pays for the five-course challenge. The experience was thrilling to say the least! Just in case you fear falling from such heights, safety is a top concern; a safety video describes safe methods for scrambling through the course and visitors wear a harness that connects them via cable at all times. Staff members watch each guest practice safety maneuvers before they are let loose on the course. Reservations are required. Children age 7-11 are welcome and all adults must have a waist no greater than 44 inches. There is no weight limit. In order to triumph at TreeUmph wear close-toed shoes and bring a lunch. Water is available throughout the course for an extra fee. It will be tough to carry your own but doable if you can connect the bottle to the harness. When you arrive you’ll have a choice to buy $3 gloves at base camp. I advise you do so unless you bring your own bike/sailing gloves. 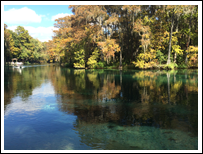 Florida springs provide one of most pristine environments to observe Florida’s flora and fauna including the beloved manatee. Weeki Wachee is one of Florida’s 33 first-magnitude springs. The spring, along with several others, combine to form the 7-mile long Weeki Wachee River. The best way to enjoy it is by kayak or canoe. The current moves downstream making the trip as easy and enjoyable as you desire. 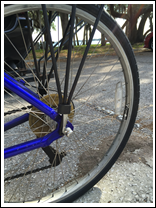 A private launch and landing ramp is located at the state park where you can rent a kayak, canoe, life preserver and shuttle ride back to your car. The escape takes approximately 3 hours to complete. Make sure to begin your adventure early as a 3 pm launch is the latest allowed. Reservations are suggested by not required if you are renting. Be sure to bring a swimsuit, water-friendly shoes, refreshments, sun protection and a waterproof bag for your camera. Restrooms are located at the canoe/kayak rental. 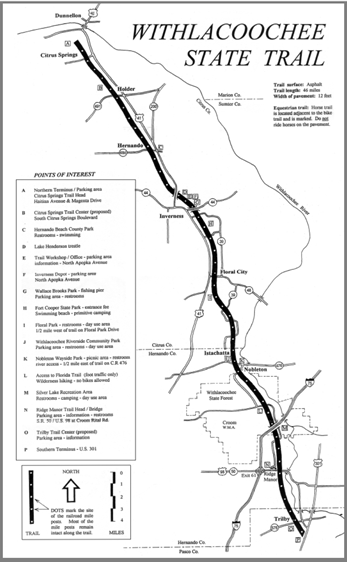 This 46-mile rail-to-trail is currently the longest paved rail trail in Florida. 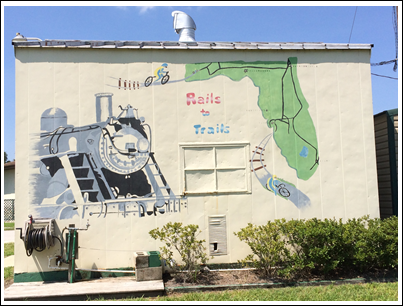 The trail runs north and south from Citrus Springs to just south of Brooksville and offers the traveler a view of charming small towns such as Istachatta, Floral City and Inverness, and access to historic venues such as Fort Cooper. Signage along the way tells interesting stories about the railroad back in the day. Restrooms, eateries and drinking water are not guaranteed depending on which section you do so prepare for your basic needs. Parking is easy to find at all trailheads.